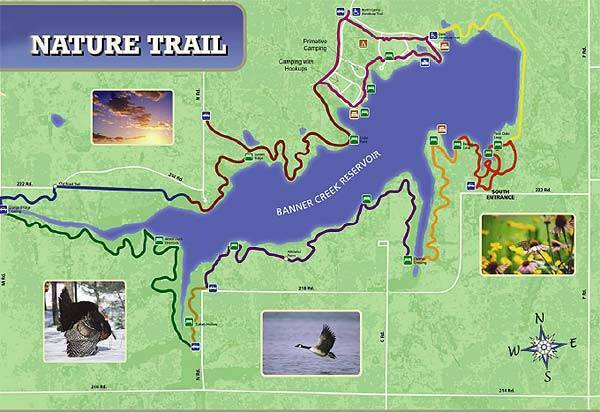 The Banner Creek Trail is located at Banner Creek Reservoir near Holton, Kansas, about 25 miles north of Topeka. From Holton, take Highway 16 west about one mile. The trail can be accessed via either the trailhead on the north side of the lake, or via a trailhead on the southeast side of the lake. The trail is over 13 miles in length, and consists of both packed earth and grass singletrack, as well as gravel maintenance roads. The trail passes over the dam, providing great views of the lake. It also passes through prairie sections that feature native grasses and wildflower plots, as well as sections through wooded areas. There are a number of rustic foot bridges along the trail. The open areas of the trail are smooth and easy, suitable for beginners, but the wooded ares provide more challenging riding, with sharp turns and some short climbs and descents.